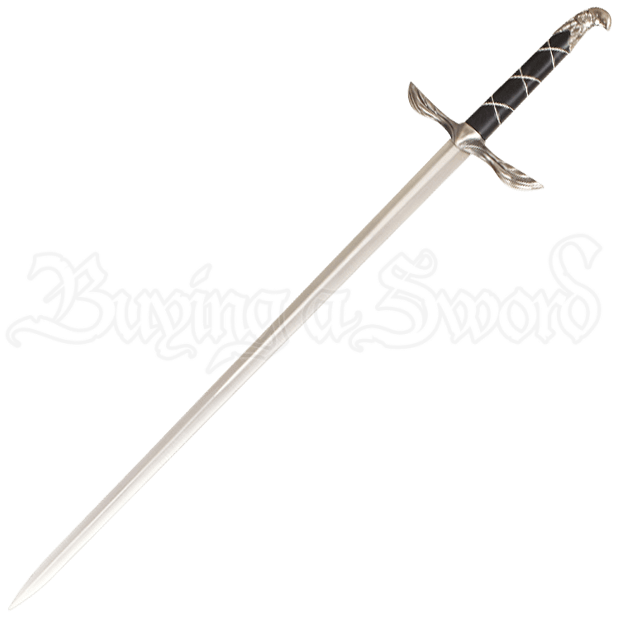 The Stainless Steel Altair Sword features a stylish silver tone hilt with design aspects reminiscent of a mighty bird in flight. Uniquely detailed, this decorative blade is inspired by the weapon from the Assassins Creed video games. Made of stainless steel, the blade has a blunted edge and is followed by a straight guard with its arms outspread and textured to resemble feathery wings. The black grip features crisscrossed silver cords. In a silvery color that matches the guard, the pommel has a curve to it, almost like the beak of a bird. With the included matching leather wrapped scabbard, this Assassins Creed sword makes a fantastic collectible for fans of the hit franchise. Gift it to a loved one fond of Assassin style weaponry, or display the decorative blade yourself as part of a collection or display.